Experience the breathtaking beauty of Iceland with geeks from around the world. Explore parts of the back-country not visited by everyday tourists. 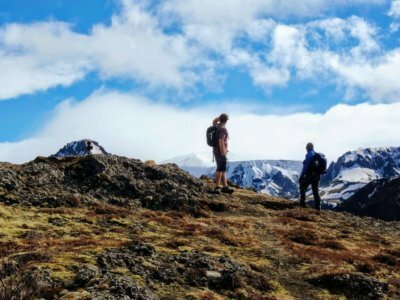 With beautiful Þórsmörk as the background, we'll lodge at the Þórsmörk Volcano Huts (yes, they're heated), visit the enchanting town of Hveragerði and their thermal bath, explore extraordinary waterfalls, observe the Gígjökull glacier, 4x4 through beautiful terrain, have a drink or two at the Volcano Huts, and sit by the fire -- and that's just day one. 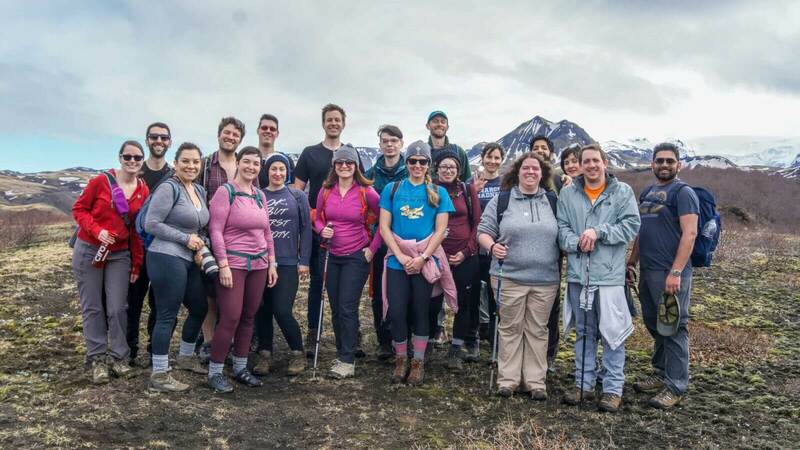 64° NORTH is one of the most unique ways to experience Iceland and network with other geeky professionals from around the world. Feeling extra adventurous? This year we're introducing an optional 'high adventure' experience where you'll learn outdoor survival basics and how to comfortably camp in cold weather (gear will be provided for those that would like to test their newfound knowledge). Note: For those that would like to arrive 2 days early (April 16th), we'll be organizing group touring activities. More info to come for confirmed participants. Volcano Huts are located in Húsadalur Valley in the Þórsmörk Nature Reserve in Iceland, right next to the Eyjafjallajökull Volcano & Glacier. The unique nature of the Þórsmörk area make this an ideal place for any nature and hiking enthusiast. Þórsmörk Nature Reserve (pronounced Thorsmork in English) has one of Iceland’s most dynamic and beautiful landscapes, where active volcanoes and towering glaciers rise above the lush valleys below. The Þórsmörk area has endless hiking trails and is connected to the Landmannalaugar Nature Reserve via the Laugavegur hiking trail. We’ll start off from the Hilton Nordica Reykjavík at 8am, and from there the adventure begins. On our way to the Volcano Huts in Þórsmörk, we’ll stop at the incredible Seljalandsfoss waterfall, visit the enchanting town of Hveragerði and their thermal bath, and then meander our way to the Gígjökull glacier. We’ll continue our journey to the Volcano Huts to unpack and explore a little. Then it’s time for a welcome drink, dinner and a big ol’ welcome campfire. We’ll have an excellent hot breakfast together at the Volcano Huts restaurant and then it’s on to exploring the Þórsmörk Panorama Trail with a picnic lunch. Want to sit this hike out? There’s plenty to explore at camp including a thermal pond, sauna, and outdoor games. We’ll find out way back to camp and relax a little before dinner. If you’re looking for some extra adventure in your experience, join us for the first day of outdoor survival class. Then, it’s dinner and a campfire to close out day two. With guitars at the ready, there might even be a little music, too. 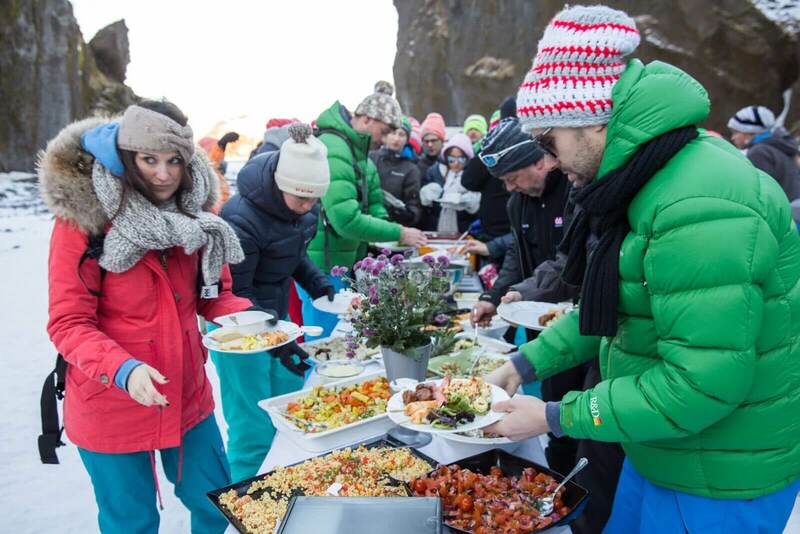 Fueling for this epic day is a must since we’ll be exploring Stakkholtsá Canyon where Game of Thrones was filmed. We’ll eat lunch on the trail, and get back to camp in time to relax and unwind, or take enjoy day 2 of outdoor survival class. After that? Dinner of course, and an epic bonfire to share our tales from the day of adventure. We’ll depart Sunday, but not before having some fresh made breakfasts from our hosts at the Volcano Huts. We’ll ride by 4×4 coaches back to Reykjavik and arrive at the airport by 2pm in time for departing flights. Your flight is not included in the ticket price (major US airlines have started non-stop service from hubs for around $600). Plan to be at Hilton Nordica Reykjavík between 7:30am and 8am on April 18th, and depart no earlier than 5pm on April 21st. We will drop off on the 21st directly to the airport. To protect your travel investment, we recommend the purchase of travel insurance. 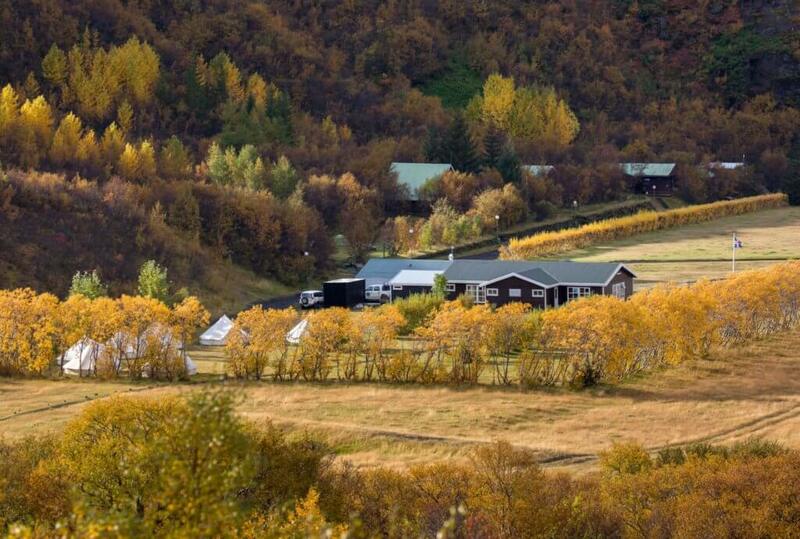 You’ll be living in luxury by remote Icelandic standards (hey, it’s not a tent!). Each room accommodates two people, and you’ll be matched with a roommate unless otherwise specified when you purchase your ticket. Rooms are heated and are all a part of a larger cabin with shared toilets in the hall of the building. 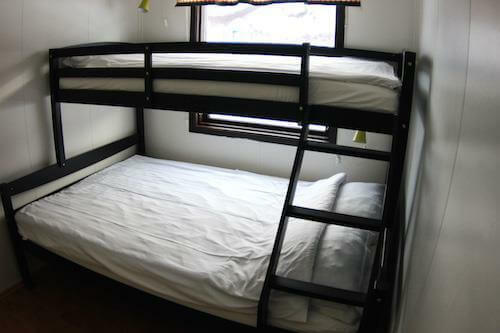 The bunks have double lower beds and single upper beds. The rooms are small but comfortable and include made up beds for extra comfort. Sauna, showers and a natural warm pool are accessible in the LavaSPA a few steps away from the building. All meals are included. Accommodations will be made for dietary restrictions (i.e. vegetarian, gluten, dairy, allergies, etc). Please fill out the relevant information in your welcome survey and we will do our best to accomodate your needs. Three meals and snacks will be provided each day. Breakfast: Homemade bread, eggs, ham, cheese, freshly cut fruit, sliced vegetables, jams, biscuits, oatmeal, cereal, milk, juice, coffee and tea. Lunch buffet: Soup, salad, home made bread, coffee and cakes. Dinner buffet: Two course buffet of lamb, pork, fish or chicken as main course, soup, fresh salad, dressings, grilled potatoes and home made bread. Day-hike Lunches: A mixture of sandwiches, snacks, chocolate bar and juices, prepared for a day-hike. Below is a list of suggested gear to bring with you on your trip. It’s not an exhaustive list, just a list that will help make sure you have the essentials. As you pack, think about these two ideas:Assume there might be precipitation. Backpacks should have waterproof covers (some are built into backpacks, so check yours), hiking boots should be waterproof, and clothes should be made of quick drying material (denim is ok to bring for a night on the town, but won’t be comfortable during a hike if they get wet). Temperatures can vary between day and night, and from day to day. Think about dressing in layers (3-5 top layers that can be taken off and put on throughout the day). Can I bring a drone for photography? Here’s a resource to check out before packing your drone https://www.uavsystemsinternational.com/drone-laws-by-country/iceland-drone-laws/. Will my phone work in Iceland? The short answer is yes, however you’ll need to check with your carrier on rates. If you’re planning on purchasing an Icelandic SIM card, our partners in Iceland recommend Síminn for 4G Internet in Þórsmörk, as Síminn has the best coverage throughout Iceland. Is it true alcohol is expensive in Iceland? Yep! Pro tip: If you’re planning on bringing your own alcohol on the adventure, a much cheaper option is to purchase at the Duty Free shop in the airport wherever you’re flying from. Do I have to work in tech to feel comfortable attending? No way! While there are many people in tech related industries that attend, people from academia, sciences, property management, and other industries also attend. Everyone has one thing in common, though -- they want to disconnect from the daily grind (and technology). What is the gender distribution? Geek Adventures trips are normally about 50/50 people identifying as female/male. No matter how you identify, you are always welcome. Where do people travel from to attend these events? We've had participants from all over North America and Europe and expect to see more geographical diversity from attendees in the future. International trips tend to see a larger international turnout than United States domestic trips. Geek Adventures started operations in 2016 and has been creating experiences for geeks ever since. I would like to room by myself, is that possible? While all participants are encouraged to room with others during the trip, sometimes people prefer to room by themselves for a variety of reasons. If you're one of those people, please get in touch and we can work out an accommodation. How does room / tent sharing work? If you're a couple traveling together, we'll make sure you're bunking together. If you're a solo traveler, we make rooming assignments based on your preference, and then based on complementary interests from the intake survey. You will never be placed in a mixed gender sleeping arrangement unless you've indicated you're ok with it. Why do people attend Geek Adventures events? Here's a sample from previous attendee registration forms -- human connection, decompression, new friendships, inspiring conversations, networking, great conversations, awesome people disconnected from the world, explore new places. Are children / families allowed at events? Unless specifically noted, trips are designed for attendees 21+. Hiking with Geeks, the free local hiking groups around North America are designed for attendees 18+ or younger children when accompanied by a parent or guardian. Does a digital detox mean no cell phones? Not exactly... we realize mobile phones are needed for safety and picture taking, we just ask that during an event, you try to disconnect as much as possible from the other stuff. Example: If you normally read on your phone, bring a book instead. If you normally play games on your phone, pick up a game at the event and play in person! You'll be happy you did. All events are BYOB. Alcohol is allowed, and sharing is encouraged. We've found that cans are far easier to take on adventures than bottles, so please plan accordingly. Have another question? Get in touch. "I would highly recommend camping with Geek Adventures, specially if you are a beginner or first timer. One of the best hosts who is friendly, welcoming and makes sure you don't feel left out. I am glad we chose this event as our first camping in the US. I feel confident and am very keen to explore more camping events in future." "One of the best things I’ve done in my life. I made great friends, learned and hiked a lot, and explored a part of the world I don’t think I ever would have otherwise." "I never wanted this event to end because it felt like the beginnings of some really excellent friendships. Hiking, sitting around a bonfire, laughing and eating with everyone was amazing and inclusive. All the arrangements were taken care of and I never wanted for anything."